This project was won in an international design competition as part of a team led by landscape architects Grant Associates. The masterplan for Marina South forms part of Singapore’s new Gardens by the Bay development and will draw from the distinctive flora of the region to create a new destination in the city. It has been designed as a series of distinct ecosystems which will enable the gardens to function with maximum environmental efficiency, and to showcase those world habitats most at risk from climate change. The garden at Marina South is home to some of the site’s most spectacular structures, including two cooled conservatories which are among the largest climate-controlled glasshouses in the world. The cool-dry conservatory explores issues related to plants and people, whilst the cool-moist conservatory focuses on plants and the planet. 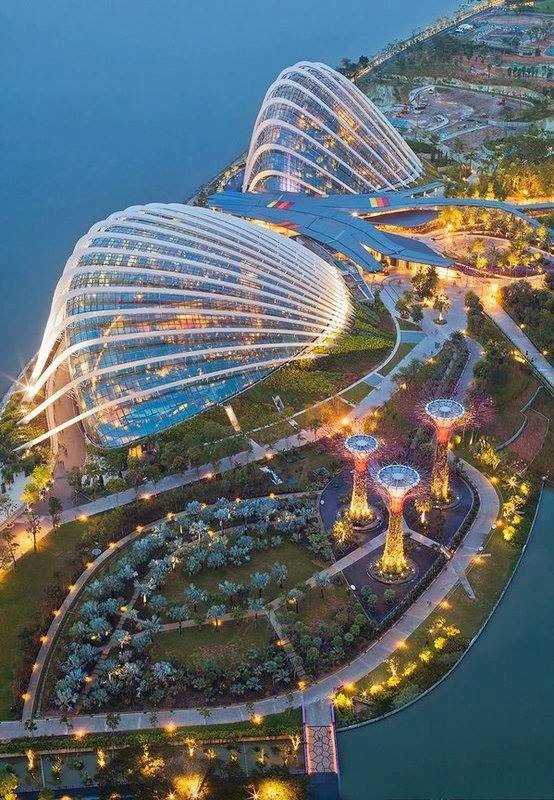 Gardens by the Bay comprises three gardens around the Marina Channel in the southern part of Singapore . Once the Marina Barrage is ready, the Marina Channel will, over two years, become a fresh water lake and supply 10 per cent of Singapore’ s water needs. The total size of Gardens by the Bay is 101 hectares or 177 football fields. Bay South is 54 hectares, Bay East is 32 hectares and the Bay Central is 15 hectares, taking over the Marina City Park.